2 times filthy, rotten oldschool Death Metal!!! 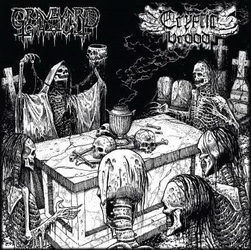 Graveyard Ghoul is back with 3 new tacks of oldschool Horror Death Metal to shorten the time until next full album! Cryptic Brood also comes with 3 new tracks, after their great, successful, sold-out demo-tape in 2013. Artwork by Mark Riddick.